We are glad that you have an interest in mining history. This list of Frequently Asked Questions contains answers to many of our most commonly received questions. Please take a moment to see if your question has already been answered. That way you will receive the fastest answer. For example, many people doing family genealogy projects will find the answers to the first three questions helpful. If you still have an unanswered question or need additional information, just contact us. Q: I am working on my family tree and have relatives who worked in mines. Where can I find more information? Q: My relative worked at the XYZ Mine. How can I find records of his/her employment? Q: How can I find out about the XYZ Mine and its location? Q: Are there any historic mines in my area? Q: I have some old mining stock certificates. Does the company still exist? What is the value of the stock? Q: How can I find out if there is a mine under my house, farm, or other property? Q: Where can I donate my old mining objects (or records)? Q: Where can I take my family (or school class field trip or Scout group) to visit a mine? Q: Where can I collect rocks and minerals? Q: Where can I obtain educational materials on mining history and modern mining? A: Many genealogists, amateurs and professionals alike, are surprised to find that they have miners in the family. Many new immigrants with mining skills were sought out as new mineral discoveries were made in the USA. For example, the anthracite coal mines in eastern Pennsylvania attracted Welsh coal miners. Metal miners from Cornwall were valued worldwide for their mining expertise. Cornish “Cousin Jack” miners by the hundreds could be found in the historic mining towns in Michigan, Wisconsin, Colorado Montana, Arizona, and California. Dreams of “striking it rich” in the 1849 California Gold Rush and several subsequent “rushes” attracted many new immigrants as well as everyday citizens to the mining areas of the country. There is a wealth of on-line information available for genealogists. However, before you start searching, it is important that you pull together what you already know: dates and places of birth, marriage, employment, and death; dates and places of residence, immigration and naturalization; names of family members including parents and grandparents, spouse, children, and siblings; etc. Ask other family members what they know. Family legends sometimes help. “Grandma always said great Uncle Dennis was in the California Gold Rush.” Even if it is fragmentary, any of this information can be a clue that will lead to more facts and, sometimes, amazing discoveries. A useful starting point for many researchers are the U. S. Census records, especially those from 1850 and later which include the names of all the members of each household. Bachelor miners and those without their families frequently lived in boarding houses which are included in these records. 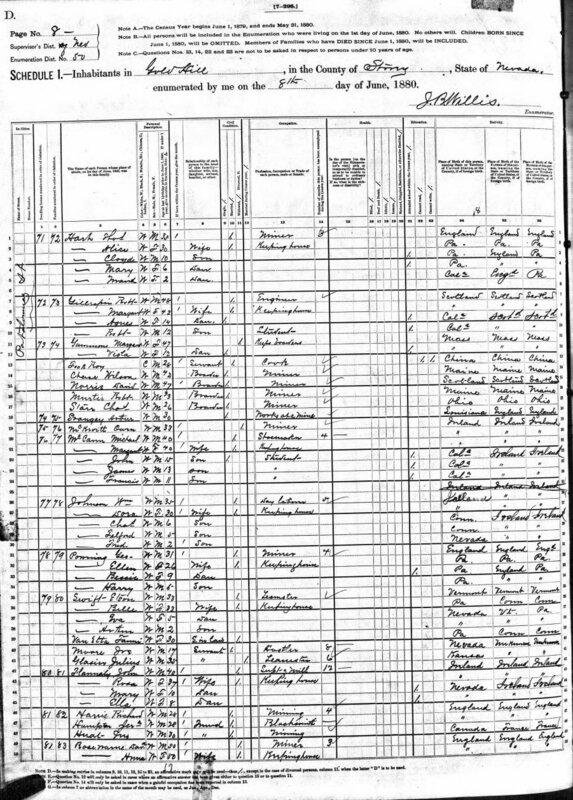 Census records are available on-line at genealogy websites such as http://FamilySearch.org and http://Ancestry.com. These and other on-line resources can be accessed through public libraries or your own personal computer. Some require subscriptions but many don’t. A page from the 1880 Census of Gold Hill, Nevada, shows married and single miners from a variety of countries and states. Click the image to enlarge. A: The more you know about the period of employment the better. For example, the dates of employment, the mine name, and the location (mining camp, town, county, state or territory) will help narrow the search in U.S. Census and other records. Once you have narrowed down your search to a particular location, local historical and genealogical societies are good sources of information. Much of this information will probably not be on-line. They sometimes have records such as old payroll ledgers or accident reports for mines in their area. They also can usually recommend other sources of information such as museums, libraries, state historical societies, and archives. Most of these organizations have a website with their contact information. In the unfortunate situations of those who died in a mining camp or town, either in a mining incident or from other causes, FindAGrave is sometimes helpful to find the location of a burial. Starting as early as the 1870s, a few states began to establish mining safety and inspection programs in coal mines. In subsequent years, other states did the same for metal mines. State Mine Inspectors usually kept incident reports on fatalities and serious injuries. These reports were sometimes published on an annual basis and can often be found through normal on-line searches. Mining incidents and fatalities were also described in local newspapers. Once again, local historical and genealogical societies are good sources for this type of information. 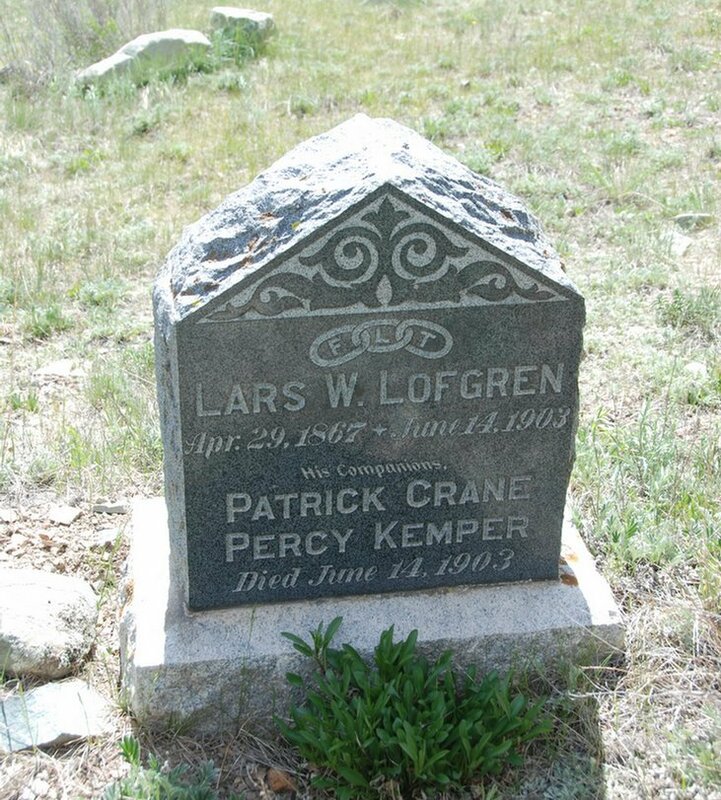 buried in Hillside Cemetery in Silverton, Colorado. A: The more you know about the mine, the easier it will be to locate information about it. There are several on-line resources that may help. The easiest first step is to perform a web search. The U.S. Geological Survey’s Mineral Resources Data System (MRDS) is an inventory of over 200,000 mines and mineral locations. The on-line version of MRDS now incorporates the extensive U.S. Bureau of Mines Minerals Availability System (MAS)/Mineral Industry Location System (MILS) database. The database is fully geo-coded (Latitude/Longitude) and has provision for an extensive array of data for each location; however, there are frequently many blank data fields. Mine location data can be displayed in map format or can be passed to Google Earth. A number of download options are included for input to other software systems (e.g. spreadsheets, GIS, etc.). The on-line mineralogy database, mindat, allows you to search on a mine name as either a “Locality Name” or a “Keyword.” The data is submitted by volunteers and may contain descriptive information about the mine as well as photos, reference sources, etc. in addition to information about the minerals that have been found at the mine. The last time we checked, there were over 169,000 U.S. locations in the database. Stock prospectuses and other company reports frequently contain much valuable information about mines. These can usually be found in libraries or historical societies. Publications of the U.S. Bureau of Mines (USBM), U.S. Geological Survey (USGS), and state bureaus of mines and geological surveys are other useful information sources. Many can be downloaded from on-line sources. The USBM was closed in 1996 but its publications are in many major public and university libraries and available from various on-line sources. USGS publications are available from its on-line Publications Warehouse. Contact information for the state surveys can be found of the website for the American Association of State Geologists (AASG). The Northern Mine Research Society in the United Kingdom has released a database of international mining information gleaned from British newspapers (https://www.nmrs.org.uk/mining-database/). The database incorporates the large amount of indexing work undertaken by Alasdair Niell. While most of the references are to British mines, there are also a very large number of references to overseas mines, particularly in the US and Australia. Anyone attempting to conduct detailed research on mines or mining areas where there were large British interests, will find these indexes valuable. A. The U. S. Geological Survey’s Mineral Resources Data System (MRDS) and the mineralogy database, mindat both described above, have the capability to perform searches by geographic area (state, county, township, etc.). While these computer databases do not contain all mines, they do include most of the important historic and modern mines. A: Let’s assume that you have been unsuccessful at finding out about the company by using an on-line search engine (e.g. http://Google.com) or perhaps by checking with a stock broker. Stock certificates usually show where the company was incorporated. You should check with the agency in that state that is responsible for corporations. These agencies have different names in different states. It may be the State Corporation Commission or the office of the Secretary of State. There is a website that can help you locate the proper office. A: If you know about or suspect that there was mining in your area, the first thing to do is to check with local government agencies such as tax offices and emergency responders. Another useful resource, especially in coal mining areas, is the National Mine Map Repository which is maintained by the Office of Surface Mining, Reclamation, and Enforcement (OSMRE), Pittsburgh, Pennsylvania. Their on-line database can be easily searched. It they have a mine map, you can request a copy of the map image. A: If you know where the objects, artifacts, photographs, or records are from, consider contacting the local mining museum or historical society in that area. Most such organizations welcome donations to add to their collections. If you are uncertain about their exact origin, a state historical museum, preservation group, or society may be able to help you. If all else fails contact us and we will try to help you find a good home for them. A: There are many historical mining sites and museums across the U.S.A. Check the state-by-state listing on this website. In addition, local mining companies frequently welcome organized groups for tours of their operations. Contact the company office to inquire if a tour can be arranged. Even if you are located in an urban area, there are usually quarries in the vicinity that produce construction materials such as crushed stone. These mining operations use many of the same mining and processing methods and types of equipment that are used in metal mines. Some of the best sources for information on collecting sites are the hundreds of rock, mineral, and lapidary clubs located across the country. Most clubs organize collecting trips throughout the year. The American Federation of Mineralogical Societies (AFMS) has an on-line directory of mineral clubs. State geological surveys can frequently suggest collecting sites. Teaching materials on modern mining are available from many sources. The Minerals Education Coalition (MEC) offers a wealth of minerals and mining educational materials in its website. (http://www.mineralseducationcoalition.org) The Women in Mining (WIM) Educational Foundation offers a number of classroom activities. A teacher favorite is “Cookie Mining.” (http://www.womeninmining.org/edu-activitiesAlpha.asp) Industry associations such as the National Coal Foundation (http://teachcoal.org/for-teachers) and state mining associations such as the Nevada Mining Assn. (http://www.nevadamining.org/issues_policy/activities.php) also offer materials for teachers. Field trips to operating mines can sometimes be arranged by contacting the mining company office. If you haven’t found an answer to your mining history question, contact us.